A reality shows such as KBC and Bigg Boss are inherent part of our life. People love to watch KBC and Bigg Boss. This may be either to satisfy their temptation to know who will win the contest or express their love and affection to Bollywood star hosting these shows. Whatever be the case, one thing is sure that reality shows like KBC and Bigg Boss teach us valuable lessons about money matters. 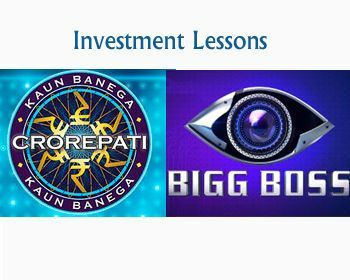 In this post, I will share 15 Finance and investment lessons that we can learn from KBC and Bigg Boss. What to learn from KBC? The first financial lesson to learn from KBC is setting up the goal. Every potential contestant of KBC set up a goal to become crorepati while applying for KBC. This is similar to setting up a SMART goal before making any investment. Your goal should be specific, measurable, attainable, relevant and time-bound. You should consider resource availability and risk appetite before setting up the goal. The second important financial lesson to learn from KBC is fluency in decision making. As a part of shortlisting, KBC contestants are asked to play the fastest finger first. The contestant who takes fast decisions and give correct answers to the questions will become a winner and play KBC. Similarly, you have to be smart and fast when it comes to decision making related to finance. Taking up a correct decision for the selection of the right investment instrument at right time will help you to become a winner. Also Read – How KBC Winner Sushil has spent his 3.5 Crores? Knowledge plays an important role while playing KBC. If you are knowledgeable, your chance of winning big money in the KBC is higher. Similarly, knowledge plays an important role when it comes to finance and money making. KBC is Mind game and you have to be sharp while playing KBC. The contestant gets tense when they move ahead in the game. They may take up a wrong decision in fear and anxiety. Controlling your behavior is extremely important while playing KBC. Similarly, when it comes to the investment you have to control your emotion and take the right decision. In the game of KBC, players opt for lifeline called Expert advice. In this lifeline, one expert is available who can help a player in answering the question. Similarly when it comes to financial life and investment, if you are stuck you should take help from an expert. Jodidar is recently introduced lifeline, where a player can take help from the partner. The contestant can take help from designated family member or friend to answer the question. Similarly, in financial life, you can take help from your spouse or knowledgeable family member when it comes to taking up an important decision. Audience Poll is one of the most popular lifelines of KBC. In this lifeline opinion of the audience is taken when contestant opts for this lifeline. The data is compiled and shown as composite feedback. The decision is usually taken based on feedback from the audience. Similarly, when it comes to taking a financial decision you should take feedback from historical return and feedback from interested parties. In the game of KBC as contestant move up the risk level increase. They have to be careful in doing risk mitigation based on risk level. Similarly, when it comes to the investment you have to take a wise decision based on risk level. Tax is applicable on the KBC winning amount. This means you will get amount after deduction of tax. Similarly, when it comes to the investment you should see it with respect to the applicability of tax. In the game of KBC, when the contestant is unable to find the answer they can quit the game and take away winning amount. Similarly, when it comes to investment if you have achieved the target or you are unsure about the future return you should quit from the investment. What we can learn from Bigg Boss? The first financial learning from Bigg Boss is budgeting. In Bigg Boss, many time task is given to contestants to manage their expense in limited resources. This reminds me about the first step of financial planning – Budgeting. You have to control expense and stay within budget. The chance of winning Bigg Boss is higher if you are cool-headed. The cool-headed person can manage the situation well and stay longer with any type of person. Similarly, in financial life, you have to be cool-headed and manage the adverse situation with skill and knowledge. Wild Card Entry is possible in the Bigg Boss. The wild card entry of contestant can change the game. It indicates emergency situation may arise anytime you have to be financially ready to manage the situation. Bigg Boss is supreme. He can change the rule of the game with a small announcement. Similarly, when it comes to investment in the stock market we can say the market is supreme. Any small news related to politics or economy can change market conditions. Bigg Boss winner is one who stays longer in the Bigg Boss house. Similarly, when it comes to investment in the stock market, an investor who stay invested in the market for the long term usually turns out to be a winner. I hope above financial and investment lessons about KBC and Bigg Boss will help you in improving your financial life. Do share your learnings from KBC or any other reality show in the comment section given below. How KBC winner Sushil has spent his 3.5 crores ?